Mighty Switch Force! Hyper Drive Edition (a.k.a. 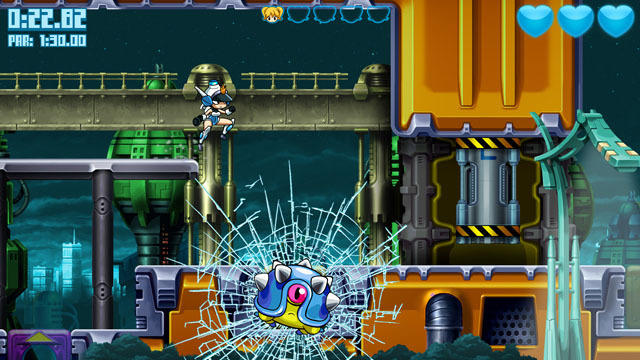 Mighty Switch Force HD) is a high definition re-release of the original Mighty Switch Force! on 3DS (2011) with redrawn HD graphics. The game has all of the content of the original release and also offers a new set of remixed "Hyper" levels with tougher layouts and more difficult environmental puzzles. The Hyper Drive Edition was originally released on Wii U in 2012 and is now available on PC. The game stars Patricia Wagon as she switches between dimensions to arrest escaped convicts, causing blocks to alternate between solid and transparent in order to complete puzzle-platforming challenges. The PC version of Mighty Switch Force! Hyper Drive Edition is now available on PC via Steam. Check our full coverage here.